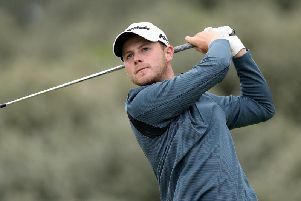 Harry Ellis is hoping a meeting with Jack Nicklaus this week will inspire a second round revival at this year's Masters. The Meon Valley Golf Club member shot a 14-over-par 86 as he propped up the leader board after day one at Augusta. Ellis begins his second round at 5.10pm (BST) in the company of 1998 Masters champion Mark O'Meara. But it's another member of the Green Jacket club who has been offering the Florida State University student a key insight on what to expect from the manicured fairways and pristine greens of the National club situated next to the Georgia/South Carolina state border. Nicklaus is widely regarded as the greatest golfer of all time, with 18 Majors to his name - including six wins at Augusta. 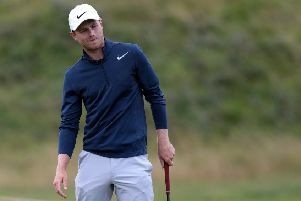 British Amateur champion Ellis had a chat with the Golden Bear at the start of the week - and is hoping to use the insight provided, plus his own natural game, to shoot a more respectable round today. He said: 'It was great to be able to sit one‑to-one with him and listen for how he played the course and how he sees the course. 'The footprint of the course is still here, but obviously it's lengthened over time, but the same principles apply. 'And the principles he told me I sort of didn't do yesterday, which was probably part of the problem. 'But I think going forward there's a lot of things from that experience which are going to come back even for today, it's just making sure and executing those things that he mentioned to me, but also my own game as well.